After last months significant rise in the 15-year gilt yields after the Federal Reserve discounted the need for Quantitative Easing 3 April experienced a fall in yields to a low of 2.54% before ending at 2.67% or down 5 basis points. The uncertainty was due to a change in sentiment over Europe and an expectation that the Eurozone was heading for recession which would be deeper than expected. There was concerns for the global economy, comments made by the International Monetary Fund (IMF) that the Eurozone would undermine financial stability and the realisation that Spain may need a bailout as the banking system was virtually dependant on loans from the European Central Bank (ECB) to maintain their day-to-day liquidity. Spain's bond yields reached a high as investors see contagion spreading from Greece. Despite there being a positive recovery in the 15-year gilt yields since reaching a month end low of 2.43% in January 2012, the problems of the Eurozone have not been resolved and therefore it is likely that should the banking crisis in Spain escalate investors will seek safer investments such as UK government bonds and gilts. This demand would increase the price and reduce the yields which would mean lower annuity rates for pensioners later this year. 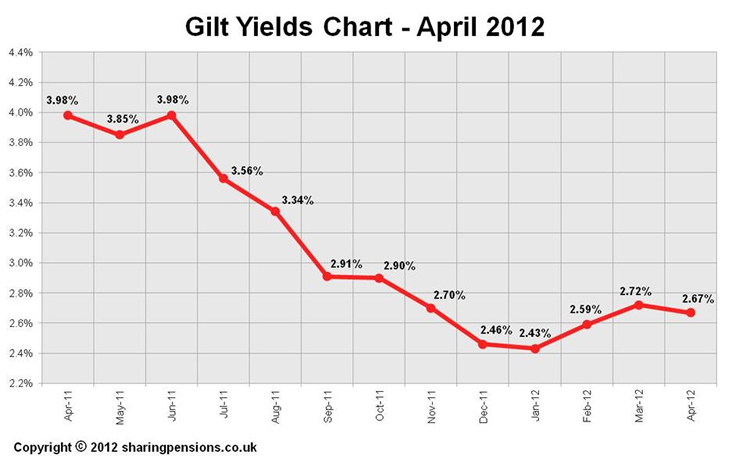 As a rough guide if gilt yields reduced by 10 basis points this would mean a decrease in annuities by 1%. Currently if gilt yields increase by 10 basis points providers are likely to wait before following or may not reflect the full increase. See Annuity Rates 2012 for the latest updates.